On the 15th of April, Mr. Pema Gyalpo, a fair trade advocate and the CEO of Ancient Bhutan Tours who have learned the concept of Children`s Forest Program (CFP) upon his visit to Kumamoto, Japan in March spearheaded the inception of CFP school in his hometown in Bhutan. 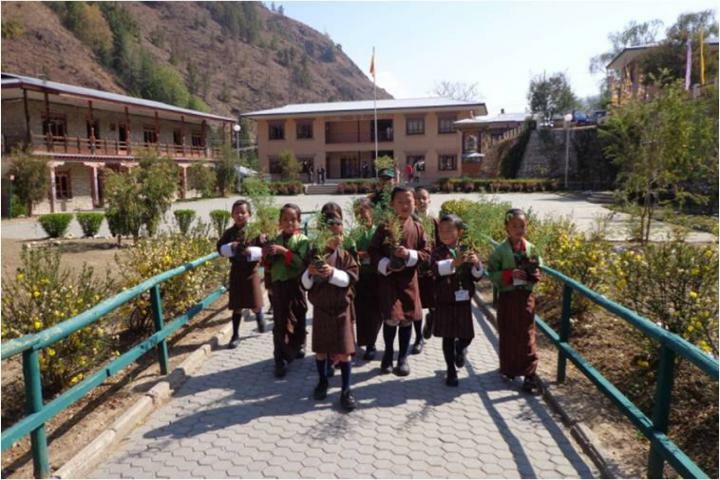 The ceremony was held on the 15th of April at Khasadrapchu Middle Secondary School located in Mewang Block in Thimphu District. Located in an elevation of 2,150 above sea level and 18 km from the country`s capital, the school has 892 students, 44 teaching faculty and 20 supporting staff. 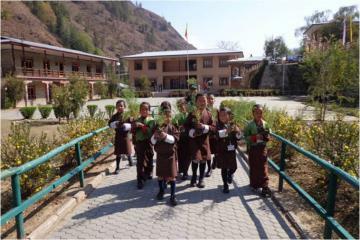 Within the school vicinity, 10 saplings of Bhutan cypress were planted by the students from classes I to III under the guidance and assistance of the invited forest official. The Bhutan cypress is the national tree of Bhutan and is often associated with the Buddhist religious places. It thrives well in the area and is readily available at the forestry nursery next to the school. “I am hopeful that this activity will go a long way and at one point of time, it will bring us together to share our experiences along with those innocent little boys and girls”, was the statement of Mr. Pema. Mr. Karma Samphel, the school principal agreed to plant another 100 saplings on the 2nd of June in celebration to the Social Forestry Day of Bhutan. The students holding the saplings of cypress on their way to the planting site. The forest official giving a demonstration on the proper way of planting the saplings.